Running a digital marketing business? Need to accelerate your growth? This guide shares some advanced tactics to grow your digital marketing agency faster. It’s tough out there for digital marketing businesses. Startups are eating away at your market share, global competitors are undercutting your prices, and large consultancies are stealing your biggest clients. To make things worse, the technologies you work with keep changing every few months and there is a perpetual talent shortage. What can you do to help your business not just survive but thrive in this environment? Ask this question online and you’ll be bombarded with a list of growth tactics. But as an industry veteran, you know that quick-fix tactics aren’t the solution to your growth problems. Instead, you need a strategic approach that helps you stand out from competitors, take advantage of trends, and achieve operational excellence. And that’s exactly what I’ll focus on in this post. I’ll share strategies, approaches, and processes you can use to help your digital marketing business grow faster than ever. The digital marketing business might be easy to start (which is why you have so many competitors), but it is also surprisingly complex, especially at scale. A successful agency has to do a lot of things right. It has to attract the right talent, utilize their time well, and find clients who need their services. You can categorize these as ‘marketing’, ‘operations’, and ‘sales’, respectively. Succeeding as a digital marketing business means doing all of these right. Without good positioning, for instance, you’ll struggle to attract top-tier clients. And without top clients, you won’t be able to offer either the quality of work or the salaries that draw top-talent. Therefore, the growth strategies that I’ll share below will focus on these key fundamentals. I’ll show you how to fix problems in your positioning, operations, and biz development. I’ll also share both short and long-term tactics to accelerate your growth. As an agency, your services don’t have any particularly distinguishing features. The product you sell - your expertise - is exactly the same as your competitors. Why, then, should a client choose you over others? This is why positioning assumes so much importance for digital marketing businesses. Your positioning defines who you are. It tells you - and others - who your target market is and how you serve it. In startup lexicon, you call this “product-market” fit. As an agency, you can simply call it positioning. If your goal is to grow your digital marketing business, fixing this vital aspect of your agency should be your first priority. I’ll show how to do this below. Most new digital marketing businesses are rarely discerning in their choice of clients. They’ll work with anyone who walks through the door. This often leaves agencies without any clear positioning or target market. You might be doing SEO, social media, content marketing, or even that dreaded “full-service digital marketing”. Your first step, therefore, should be to figure out how well-defined (or ambiguous) your current positioning is. Do you have a clear target market and expertise? And are you communicating it well? What skills, expertise, and experiences do you highlight across your website? If you have a ‘services’ page, what services do you focus on? What is the profile of the businesses featured in your case studies? Narrowness of expertise: Are you pitching yourself as a generic solutions provider (such as “SEO”) or highly specific services (such as “enterprise-grade on-page SEO”)? Target business size and segment: Do you clearly identify what type of businesses you work with? Do clients understand that you have specific expertise in their industry, or for businesses of their size? Your positioning is a sum of everything you focus on in your content. If you declare that you sell “content marketing for B2B tech startups” - either directly (in your copy) or indirectly (in your design) - you’re clearly telling clients (and potential hires) what you offer. Your design is a subtle but critical signal of your positioning. Small visual cues tell clients what kind of work you do and the industries you serve. Creative agencies, for instance, are often purposefully vague and use unusual, even experimental layouts and design. This inaccessibility is by design; it tells potential clients that the agency is creative and offers highly customized solutions. SEO agencies, on the other hand, often have a friendlier design. They’ll usually include the kind of things small businesses (their major clients) care about - prices, free consultations, etc. Do your navigation and layout meet the expectations of your target clients? Does your choice of colors, fonts, and design elements match your content? Is there a “design gap” between what you claim to be and what you actually look like? There’s always a disconnect between what you claim to be vs what kind of clients you actually get. You might position yourself as a “content marketing agency”, yet your client roster might be filled with social media work. The purpose of a client analysis, therefore, is to figure out what kind of clients you tend to attract, and how it impacts your positioning. What industry or market segment does each client belong to? What kind of work did you do for each client? What rates did you charge? Were they above, below, or at par with industry benchmarks? What was the size of each client’s business? Did it serve businesses or consumers? Your goal is to spot trends in your client list. For instance, you might find that 70% of your clients are B2B businesses with $50M+ in revenue who need social media work. In such a case, it might be smart to reposition your agency to focus on clients who fit this profile. The services you should be selling is usually the one you already have resources for. A digital marketing business that has a large pool of writers (in house or freelance) will do better to sell content services than website development. Categorize your in-house resources based on their core expertise (such as “content creation”, “website design”, etc.). Evaluate what kind of resources you can easily hire on a freelance basis (for instance, you might have a database of top freelance writers). Analyze your hiring pipeline. If needed, what kind of resources (by expertise) can you readily hire? Do you have an existing pool of candidates for a specific role? List any tools or facilities you own or have easy access to (for instance, you might have an on-site studio for recording video). You might find that your resources are largely oriented towards a specific skill. In such a case, it would be smarter to re-position your agency towards that expertise. At the end of this positioning audit, you should have a clear idea of how the market currently perceives you (as shown by your client roster), and what kind of gaps exist between your existing and ideal positioning. Your goal now is to fill these gaps. Have you ever wondered how your clients choose their digital marketing partners? There are some obvious indicators - pricing, past work, credentials, etc. But what happens before these factors come into play? How exactly do clients shortlist the agencies to approach? The truth is that clients make a series of “micro calculations” before they decide to send you that first email. These calculations are rarely conscious; it’s the way your brand feels that often sparks that initial interest. You’ve probably felt it yourself when you’ve landed on a website and just felt that they’re aligned with your interests. Understanding these “micro-decisions” can make you a much more attractive partner. Clients hire marketing agencies for one thing: change. It doesn’t matter what you sell, every business you serve wants to change something about itself - its traffic, brand perception, social impact, etc. This makes the agency-client relationship intrinsically aspirational in nature. Clients hire you because they aspire to change their status quo. Think of a 50-year-old firm that partners with a young and disruptive agency to break into a new market. Or a recently funded startup that works with a growth hacking agency to accelerate its traffic. Which is to say: your positioning should reflect the values and results your clients aspire to. It should echo what they want to be, not what they are. Consider this CitizenGroup’s website as an example. The headline clearly identifies what kind of clients the agency works with - businesses that are “ready to live their purpose”. Surely, this is something a growing business can aspire to. Revisit your buyer personas. Use them to figure out the key values, qualities, and results your ideal clients are looking for. Do they want “tried and tested” or “new but unproven” work? Are they interested in “disruption” or would they rather play things safe? All your marketing should be aligned with these values. Your clients will come from a range of backgrounds and experience levels. Some might have half a dozen digital marketing businesses on payroll. Others might have never worked with an agency before. This isn’t accidental; WebPageFX’s clients are mostly small businesses on limited budgets. While ROI is important for everyone, small businesses have to be particularly careful about it. An agency that assures them that they can track their ROI all the time becomes more appealing. The FUDs will change depending on your target clients. A Fortune 500 company, for instance, might be concerned about data security and customization. A small business might be concerned about prices. Company size: How small/large is the agency? Clients usually seek “size alignment” in their partners (i.e. large companies partner with other large companies). Cost: Is the service affordable? Does it offer enough visibility in spending? Cost is a particularly big concern for small businesses. Credentials: Small businesses often care about their partners having the right credentials and certificates (such as ‘Google Partner’). Privacy: Large businesses will want to know that their data will remain private and confidential. You don’t have to address these directly, but offhand mentions in your marketing can reassure clients. For instance, instead of sharing your employee headcount, you could mention that you’ve been in business for “20 years”. One of the pitfalls of running a marketing agency is your lack of differentiation. Your “products” are essentially the same as your competitors. The only difference is in the manner of delivery. This lack of differentiation poses a dilemma for clients. When all alternatives sound the same, how do they figure out what’s a good partner for their business? You’ll find that clients quickly establish reference points to evaluate their options. They’ll look for signs that your agency has worked with similar businesses in the past. Keywords, images, client logos, etc. Anything that tells clients what kind of agency you are and what kind of people you work with. Consider London-based agency Wolff Ollins. On their homepage, they make their mission clear: they partner with “ambitious leaders” to create better businesses. Surrounding this text are images of brands the agency has worked with: Uber, Alibaba Cloud, ZocDoc, GrubHub - all massively ambitious endeavors. These are all signals that tell prospective clients of the kind of work they do, and the kind of businesses they tie up with. Similarly, look at Sunnystorm, a salon marketing agency. From the choice of colors to the model in the hero image, everything acts as a reference point: that this agency markets salons. This is something agencies don’t often think of but it is vital to winning clients. By using words and visuals in the right way, you can quickly tell clients that you’re the right fit for them. There is a lot more to growth than just positioning. In the next sections, I’ll cover operations and new business development to accelerate your revenues this year. As an agency, you’re in the business of trading time for money. Your success depends on utilizing your resources efficiently. Any time your people waste is time you can’t bill clients for. You can’t, of course, add more hours in the day. But you can make better use of the hours you have available. By streamlining operations, you can help your people focus on only delivering value to clients. Operations isn’t as “fun” as chasing the latest marketing fad, but it can have a drastic impact on your bottom line. Fix your operations and you’ll have a much easier time scaling your digital marketing business. Below, I’ll share some strategies to make better use of your resources. One of the biggest operational mistakes you can make is to optimize for the wrong requirements. An agency that sells $500 SEO packages needs a very different operational approach than one that sells $500,000 TV campaigns. Your first step, therefore, should be to figure out what kind of things you need to optimize for. To do this, you have to take stock of your broader business strategy. What kind of business do you run? What does your client profile look like? What kind of clients do you want to attract in the future? If your agency sells low-priced solutions to a large number of clients, you’ll have to focus heavily on processes and scalability. You can’t afford to lose time creating process documents and templates from scratch. On the other hand, if you sell heavily customized solutions to a limited number of clients, you can get away with a lack of operational rigor. Scalability, i.e. the size and scope of your projects. If you mostly deal with projects of the same size, your processes can be more uniform. Flexibility, i.e. the range of industries and areas you work in. If you focus on a specific industry (such as B2B tech marketing), you can develop highly specialized processes for it. Customization vs templatization, i.e. whether your solutions are highly customized or use the same proven formula. In general, the low-price, high-volume agency model requires a strong focus on processes and templates. The high-price, low-volume model, however, gives you enough room to create custom processes for each project. A way to plan activities for your resources. A place to converse and collaborate on individual deliverables and projects. A platform to keep track of time, revenue, and expenses. While most PM systems do a good enough job of #1 and #2, they rarely get #3 right. And it’s often the lack of visibility into finances that undoes an agency. Ask yourself: do you know your exact utilization rate for last month? Do you know your profit margin for each client and project-type? Can you pinpoint how much money you’re making for each full-time employee? For most agencies, the answer to these questions is ‘no’. This data either goes untracked, or it remains locked up in disparate systems. The result is poor decision making and even poorer insight into the business’ health. You can’t really optimize your operations if you don’t even know how your resources are spending their time. This way, you can track the efficiency and effectiveness of your resources from a single platform. In Workamajig, for instance, you get complete visibility into your agency’s finances. Want to know how profitable each client is (so you can pursue more such businesses)? You can look it up in seconds. Want to know how profitable each employee is? You can check that as well. Insight is the first step towards optimization. Integrating financial data into your PM systems will give you unprecedented insight. So much of an agency’s work can be turned into a repeatable process and automated. Collect key information such as logins, data access, etc. You can easily set up a bunch of automated emails that can collect all this information without any human involvement. You don’t even need any fancy tools for it - your basic email marketing software should be able to do it. Automation is crucial for reducing the amount of time your resources spend on non-billable activities. If they have to waste time creating project reports from scratch, or manually collect data, they can’t focus on delivering value to clients. Make a list of every step you take from a project’s initiation to final delivery. Ask yourself: how can I automate this? Can I turn this into a repeatable process? If I’m going to use it again, should I turn it into a template? 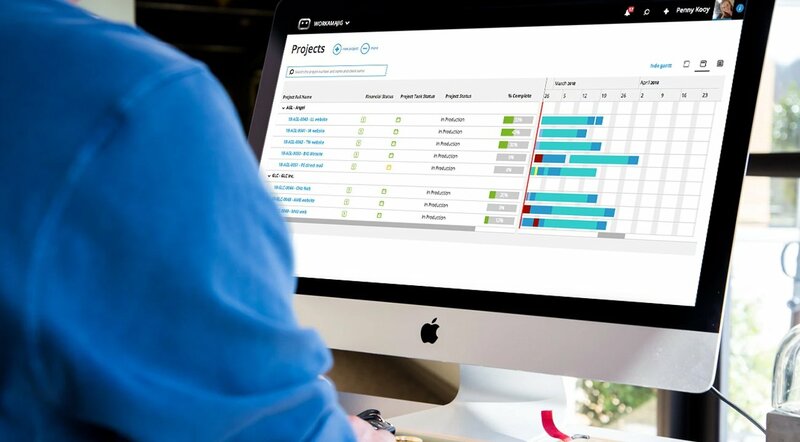 For instance, instead of emailing reports and asking them about the status of a project, you can just use PM software to get project status automatically. Similarly, instead of creating new reports from scratch, you can create templates for different use-cases and alter them as necessary. Your resources should spend time on their core expertise, not collecting information and entering data. The more you can automate away, the better. You can read all the agency growth tips in the world but they can’t really replace real-world experience. Best practices for one agency might fall flat in another. This is why high-performance digital marketing businesses focus so heavily on institutional knowledge. Everything they learn during the project - the best resources for a particular job, the ideal client-type, the perfect process - gets shared on a single platform. This knowledge sharing helps the agency build up a better understanding of its business. You’ll know what kind of people to hire, what kind of clients to chase, and what parts of your operations to bolster. Quick access to vital documents and data will go a long way towards streamlining your operations. Any time your resources waste gathering requirements, seeking approval, or searching for files is unproductive time. Creating a searchable hub to share all documents and data (with permission control) can make it much easier to find what you’re looking for. There are so many things you can learn from each project. You might find that one of your resources is habitually late on deadlines, but delivers work the clients love. Or you might find that your resources love working with clients from a particular industry. All these learnings form a part of your agency’s institutional knowledge. Think of these as “insider secrets” that help you run a better business based on real-world experience. What could you do better in terms of planning and execution? Who were your best resources on this project? Why? Where did you fumble in terms of client communication? How can you improve it in the future? Was the project profitable? If yes, did your people enjoy working on it? And most importantly, was the client happy with the results? Once you have all the answers, compile them into a document that can be shared with the entire agency. Consult this guide to learn how to close projects better. Maximizing the potential of your resources is one way to accelerate agency growth. But what about finding new clients? I’ll cover agency new business in the section below. One of the hardest parts of running an agency is dividing your attention between the two aspects of the business: serving existing clients, and winning new deals. As it often happens, agencies succumb to focusing on the short-term goal of serving their current clients. The long-term goal of winning new deals, meanwhile, gets ignored. The lead pipeline dries up and you suddenly go through that familiar feast-famine phase. For an agency on the growth path, this approach can’t do. Client work should be your top focus, but it shouldn’t come at the expense of sales. In the sections to follow, I’ll share some advanced agency new business tips that will change how you approach business development. It’s no secret that referrals are the biggest and arguably the best source of leads for agencies. In fact, 90% of agencies in a HubSpot survey ranked it their top lead source. The problem is that referrals are not reliable. A client might refer his friends to you. Or he might not. You can’t guarantee a full pipeline based on referrals alone. But it doesn’t have to be that way. Referrals can scale - they just require the right approach. Meet all these three ingredients and you’ll have a referral system that can drive leads constantly. Sylvia has covered how to build such a referral system from scratch in this guide. When you’re selling your agency’s services, focus on the results you bring, not the work you do. Because marketers demand it. It used to be that within businesses, profit used to be the domain of sales. But as the lines separating sales and marketing get blurred, marketing is assuming more and more responsibility for profit and loss. Thus, the marketers you work with are on the hook for the company’s P&L. An agency that promises them financial results will get a look in ahead of agencies that only sell “good work”. Of course, this will involve reorienting your entire marketing and sales approach. But in a world where marketers are sharing the burden of P&L, it will be worth it in the long run. A dedicated business development team can help you close deals faster. It can also help you prospect for new opportunities at scale. For the right agency, building a biz dev team can hyper-accelerate growth. The sales cycle is short - under 90 days. The ticket price for each contract is small. Target clients are usually small to medium-sized businesses. They mostly sell standardized solutions. The decision-making hierarchy is clear and limited. Think of an agency that sells SEO packages to small e-commerce stores. The product itself is fairly unsophisticated and doesn’t require significant client education. Since the target market is small businesses, it’s easy to get a hold of the decision makers without much relationship building. For such agencies, a business development team would be a great fit. However, if you sell heavily customized solutions to large companies, a low touch, standardized sales approach wouldn’t work for you. If your target clients are Fortune 500 companies, you’ll have to invest significantly in relationship building. If this describes you, a biz dev team won’t help you much. You’ll do better investing in account managers and developing relationships. Clients typically have long-standing relations with their agencies. WPP, for instance, was Ford’s agency of record for 75 years. Luring clients away from their agency partners requires more than just better services and cheaper prices. You also need to get your timing right. They get new decision makers, such as a new VP of marketing, CMO, etc. Approaching a client when they’re already in the middle of a fruitful relationship will likely see you shot down. But approach them when they’ve just reviewed their relationship and found some gaps in the service and you just might get a chance. This is why it’s important to not just choose the right sales approach, but also time it right. You can read more about sales timing in this guide. The digital marketing space is hyper-competitive. Growing a business takes more than just skilled execution. You also have to position your agency correctly, streamline operations, and keep winning new business. These advanced tactics will go beyond the basics and put you on the path to hyper-growth. Combine them with great creative work and you’ll see your agency thrive in this new year and beyond. One thing that can help you run a better agency is to improve operations. The easiest way to do that is to adopt a better project management system. Workamajig’s ERP solution gives agencies all the tools they need to manage their businesses effectively. Hit the link below to schedule a demo of Workamajig.